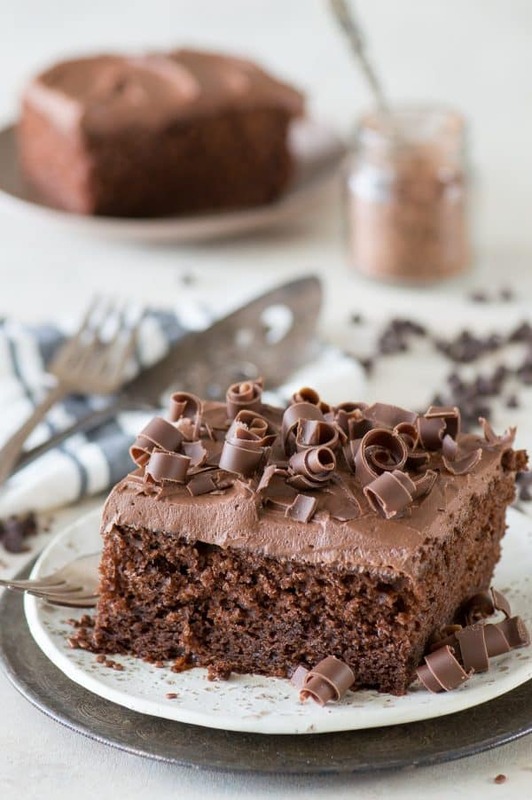 This is hands down our favorite doctored up chocolate cake mix recipe!! Doesn’t use pudding or coffee which is great. Always get tons of compliments on it! You didn’t think we would leave you hanging did you? When we posted this recipe for a doctored up white cake mix a few weeks ago, we got questions about how to doctor up a chocolate cake mix. 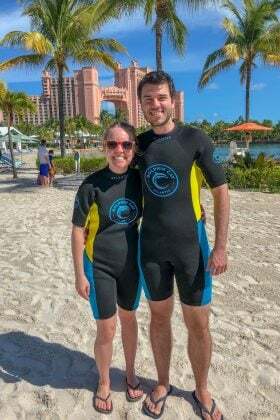 So we’re sharing how you can do that! The big thing for me when coming up with this recipe was I didn’t want to use pudding mix or coffee as elements to doctor up the cake mix. There are already a lot of doctored up cake recipes out there that use those things. 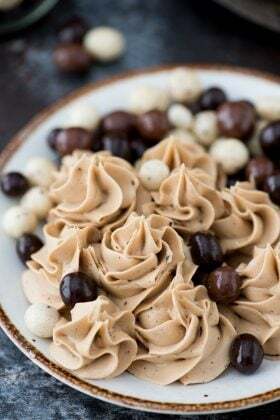 Plus, a common thing I saw people asking was “What can I use in place of the pudding/coffee?” So we’re bringing you a recipe that doesn’t use those items. So that was the goal, doctored up chocolate cake without pudding or coffee. 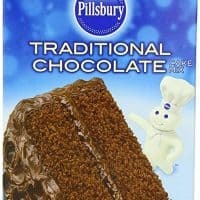 To make doctored up chocolate cake you need to start with a high quality box of cake mix. 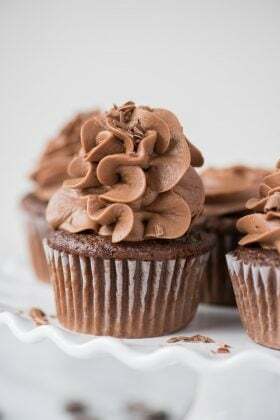 I prefer to use Duncan Hines cake mix (and I’ve heard other bloggers say the same) because they have great balance between flavor and moistness, plus Wilton recommends that brand and I trust those cake people! 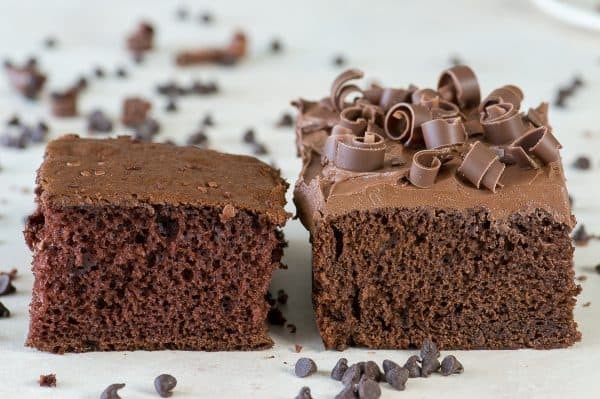 The above image compares 2 pieces of cake – the one on the left is a chocolate cake mix, following the directions on the back of the box and the one on the right is our doctored up chocolate cake mix. You can see that the left one is pretty airy compared to the right one. The doctored up version is incredibly moist and it’s more dense, like a homemade cake would be. The doctored up one also has a deeper chocolate flavor. 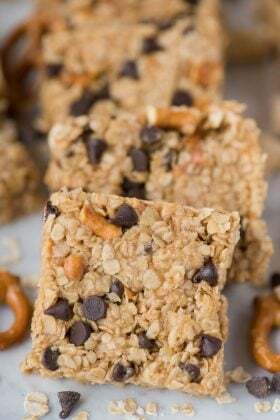 This recipe is perfect for all of us who like the ease of a box mix, but maybe want to jazz it up a bit and have more of a homemade taste. Plus, I feel that this doctored up version of a chocolate cake comes together just as quick as the box mix because you can still put everything into ONE bowl and beat it together. 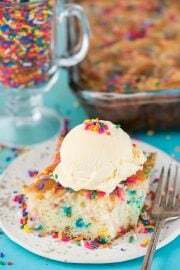 For this recipe you’ll want to use a 15.25 oz box of cake white mix. I know some boxes out there are 18.25 oz, so be sure you’re getting the right size. Adding additional dry ingredients to the cake mix like flour, sugar and cocoa powder will improve the structure and texture of the cake. Adding buttermilk will ensure your cupcakes turn out incredibly moist. Plus the acid in the buttermilk punches up the chocolate flavor. Adding additional eggs enhances the flavor and fluffiness of the cake. Use butter in place of oil. 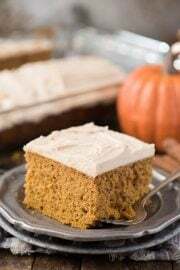 Butter has more flavor then oil and improves the texture of the cake. 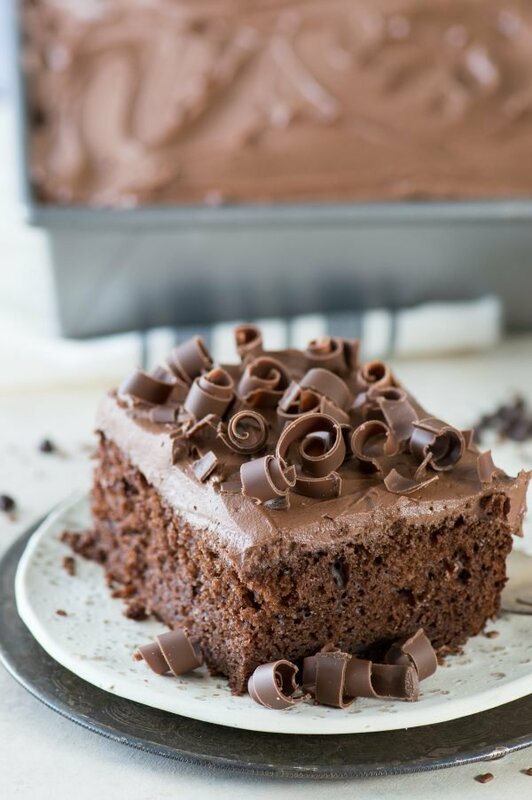 And what’s a chocolate cake without chocolate frosting and chocolate curls?! Want to know my secret for making chocolate curls? Get a hershey’s bar and use a vegetable peeler to make curls, it’s so simple! 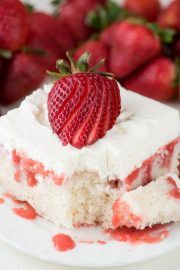 Looking for a doctored up white cake mix recipe? 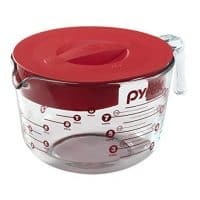 In a large mixing bowl combine the buttermilk, melted butter, eggs, vanilla extract, devil’s food cake mix, sugar, flour, and cocoa powder, beat with an electric mixer until combined, 2-3 minutes. Spray a 9x13 inch pan with non-stick cooking spray. Pour the batter into the pan and bake for 30-32 minutes or until a toothpick inserted in the center of the cake comes out clean. Allow the cake to cool completely before adding frosting. Spread on top of the cooled cake, add chocolate curls if desired. 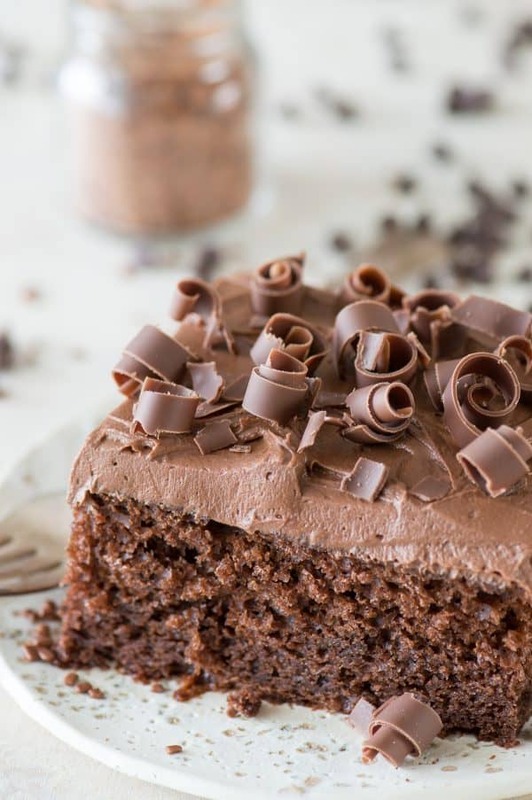 First of all, can I say a huge THANK YOU for not including coffee or pudding – I’m allergic to both, so finding a lovely quick cake recipe like this without them is an absolute godsend! However, I live in the uk and I can’t get buttermilk in the shops near me. Is there a way to make it? So many us recipes call for it, but I have no way of buying it and no idea what it actually is or how to make it!! I have several of the Cake Mix Doctor books. Unfortunately they were written years ago, before they reduced the size of the cake mixes. I used to make her Darn Good Chocolate cake all the time but since they changed the size, it just turns out as good chocolate cake. I am glad this one incorporates the smaller size and can’t wait to try it! 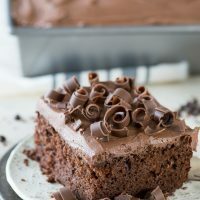 I enjoy all your recipes, I would like to know if this recipe can be used to make layers or larger sheet cakes without compromising the flavor by doubling it? Hi Iona! I would certainly think this cake could be used in a layered cake. I think doubling it would be fine, but the baking time would be affected. Thank you so much for sharing this wonderful cake recipe!!! I made it for Cub scout campfire pack meeting (in case you don’t know, 8-11 year old boys and their family gathering for awards!!) and it was a huge huge huge hit!!! It’s yummy but on top of it, it’s SO EASY to make!!!! Please imagine bunch of boys faces covering with cake crumbs and frosting :) :) means, HAPPY FACE!!!! Wooohooo!!!! We’re happy to hear this! This was very good. Sadly I flubbed the frosting with too cold butter. Do you have a white/yellow cake mix recipe? Can this cake be frozen? I like to try new things and make the portions to freeze. can the portion sizes be adjusted? this recepie did not show how may people can be served by the recepie? Am making chocolate cake with the buttercream icing, it calls for 1 cup of butter, but in method you say to cream butter and shortening, is this an error if not how much shortening are you supposed to use? Hi Rosaella, yep that’s was error – just cream the butter. No shortening needed. I fixed this cake for my grandson’s birthday and it was not good. The chocolate taste did not come thru in the cake, tho I have to say it was moist and beautiful. I looked at the recipe over and over and I do not see what I did wrong. Do you or anyone else have any ideas? The icing was excellent. Corrections please. I would like to use this again if I can solve this issue. Thanks for your recipe and for your help. Hi Rita! I’m sorry to hear it didn’t turn out for you. 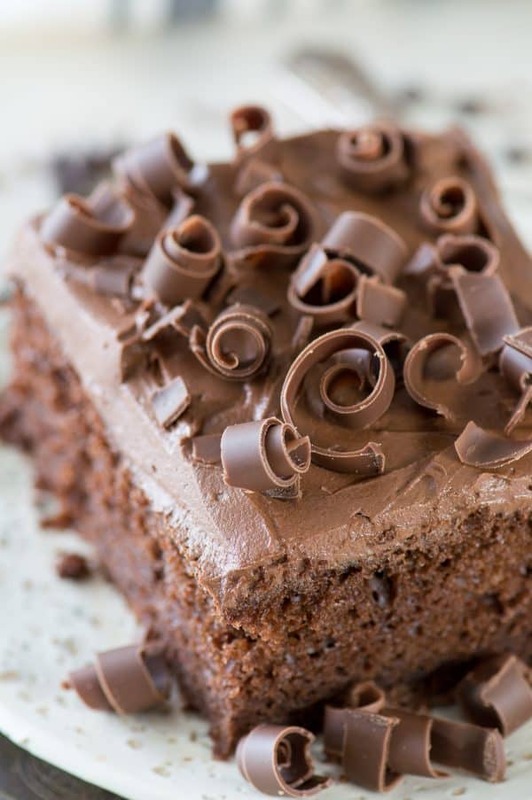 I will say that a box of chocolate cake mix isn’t as chocolatey as a homemade chocolate cake mix – maybe you were expecting like a chocolate fudge cake? However this recipe is still really good and we use it a lot!